The Hand of Vaprak! Part 1 of 4. "The Ogre's Paw!" Story by Jeff Grubb. Art by Rags Morales and Dave Simons. 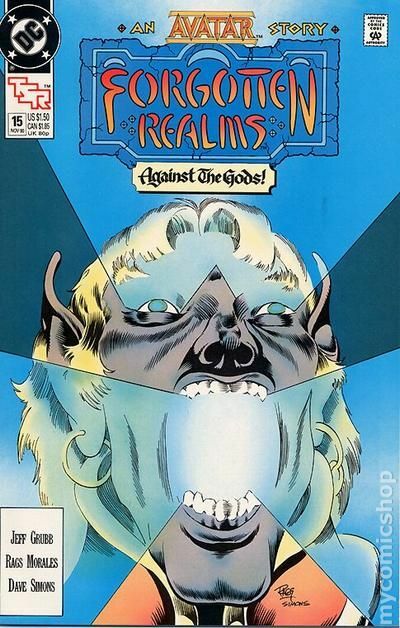 Set in the Dungeons & Dragons inspired world of the Forgotten Realms, this book follows the adventures of a paladin named Priam Agrivar (see Advanced Dungeons & Dragons (1988) #1-4 for Priam's 1st appearance) and his quest for redemption. While traveling along the Sword Coast, Priam comes across a relic of ancient and evil power. After befriending the elf cleric Vartan Hai Sylvar, Priam sets out to have the artifact identified and destroyed. Cover price $1.50. The Hand of Vaprak! Part 2 of 4. "Converging Lives!" Story by Jeff Grubb. Art by Rags Morales and Dave Simons. The paladin, Priam Agrivar, and his elf companion, the cleric Vartan Hai Sylvar, have arrived in the fabled city of Baldur's Gate. 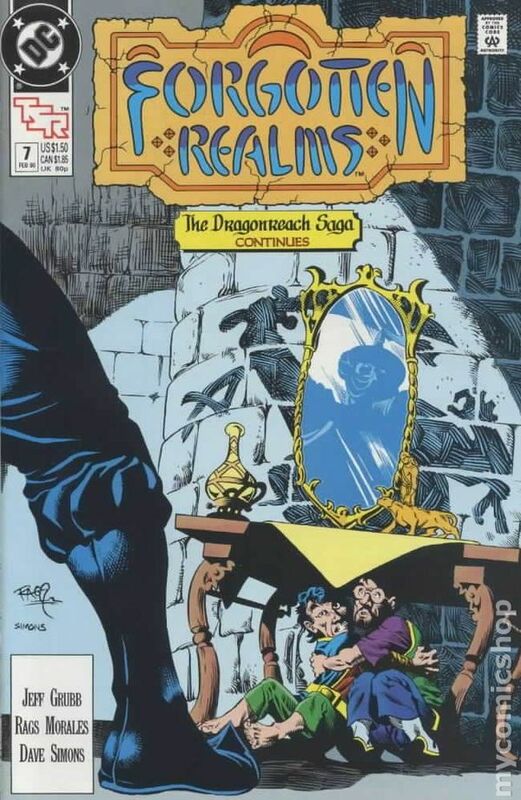 Meanwhile, the wizard Dwalimor Omen and the crew of the Realms Master have also arrived in search of the powerful and evil artifact that has managed to slip from their grasp. Plus, malevolent beings conspire behind the scenes. Cover price $1.50. The Hand of Vaprak! Part 3 of 4. "The Great Game!" Story by Jeff Grubb. Art by Rags Morales and Dave Simons. 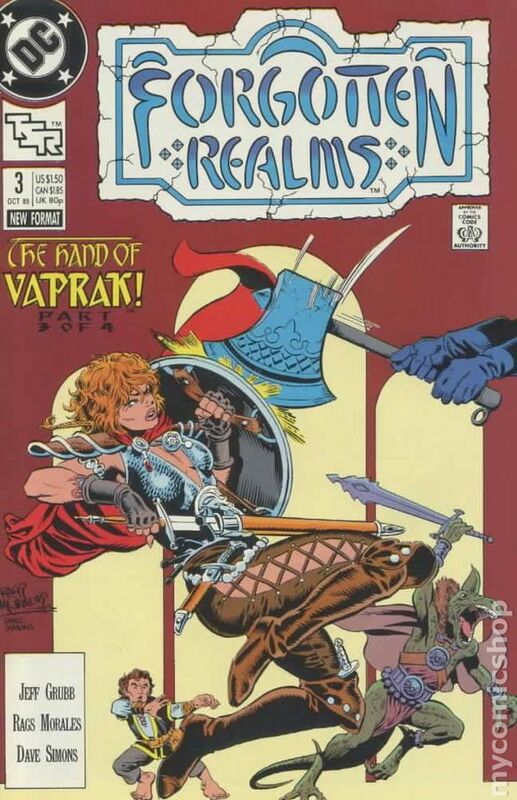 Alias of the Azure Bonds (a character from the novel of the same name published by TSR) and her paladin companion have been charged by the wizard Elminster (a prominent character in the world of the Forgotten Realms) to find and destroy the ancient and evil artifact known as the Hand of Vaprak. Meanwhile, Priam and his new friends continue their own search for the aforementioned artifact. Cover price $1.50. The Hand of Vaprak! Part 4 of 4. "Fools Rush In!" Story by Jeff Grubb. Art by Rags Morales and Dave Simons. 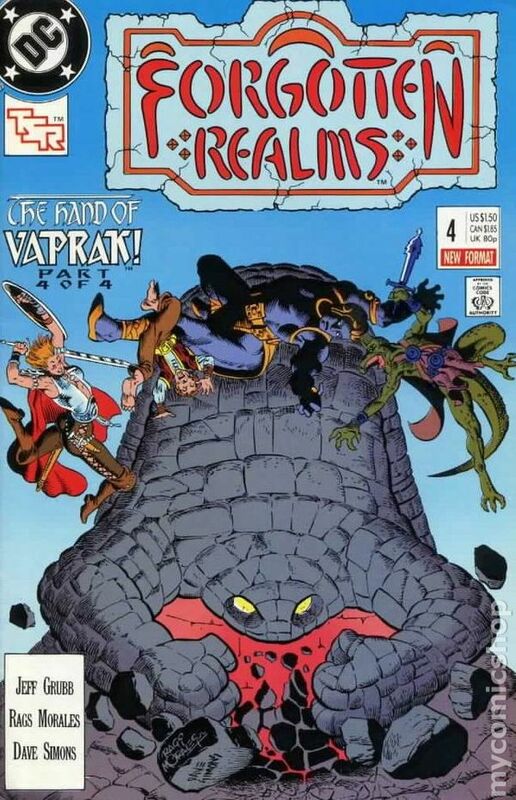 Can the paladin, Priam Agrivar, and the crew of the Realms Master defeat the Ogre Mage and destroy the evil item of power, the Hand of Vaprak, before it's too late? Well they'll have to get past an earth elemental, a powerful creature of magic, in order to do it. Cover price $1.50. The Dragonreach Saga! Part 1 of 4. "The Dragon in the Dale!" Story by Jeff Grubb. Art by Rags Morales and Dave Simons. Some powerful force is indiscriminately destroying dragons. Throughout the region, evil, good, and neutral wyrms are meeting with horrible ends. If this dragonslayer is not found soon, there will be a flight of dragons the which the Realms have not seen for generations. A flight of dragons would cause untold death and destruction and would mean the end of the civilized world as it is known. Cover price $1.50. The Dragonreach Saga! Part 2 of 4. "Dragonspawn!" Story by Jeff Grubb. Art by Rags Morales and Dave Simons. 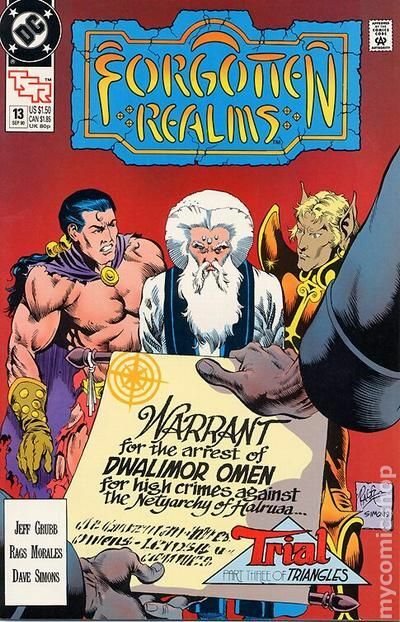 While Omen takes council with Elminster, considered by many to be the wisest man in all the Realms, and Mourngrym , Lord of Shadowdale (another prominent figure in the world of the Forgotten Realms), the dragon, Muri, takes the rest of the crew of the Realms Master to a gathering of all the great good, evil, and neutral wyrms of the land. But can Priam, a lawful good paladin, bring himself to consort with evil dragons? Even if it is for the good of the land? 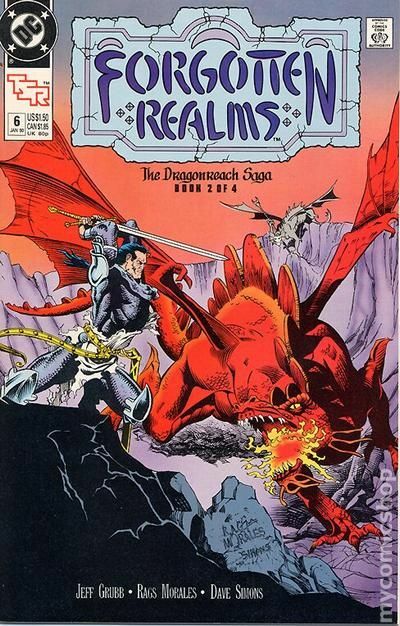 Plus, betrayal lurks in the very ranks of the dragons. Cover price $1.50. The Dragonreach Saga! Part 3 of 4. "Dragonsmoke-r!" Story by Jeff Grubb. Art by Rags Morales and Dave Simons. While the great wizards, Elminster and Dwalimor Omen, regale and carry on, Foxilon and Lhaeo find a way to get into trouble within the Elminster's tower. Plus, with a little help from a friend, Priam learns a lesson about the laws of nature, and decides to return to help his friends. Cover price $1.50. Signed by artist Rags Morales with Lone Star Comics certificate of authenticity. The Dragonreach Saga! Part 4 of 4. "Dragons (And other Beast)!" Story by Jeff Grubb. Art by Rags Morales and Dave Simons. Priam and Muri return too late. The dragons have all been slaughtered. The Outcast has used his Harvest to summon forth a Tarrasque, a titanic beast of chaos and destruction. 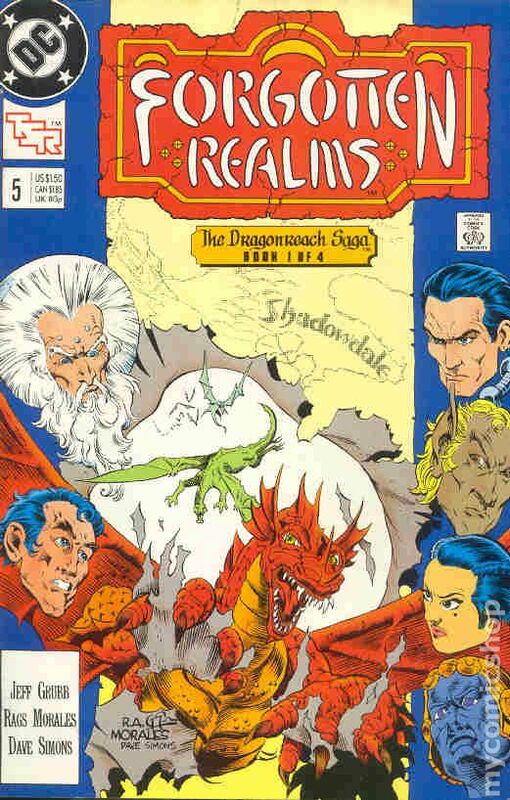 Can the crew of the Realms Master somehow find a way to destroy this new threat to the Realms? Meanwhile, Mourngrym and his wife welcome into the world their newborn son. Cover price $1.50. "The Morning After!" Story by Jeff Grubb. Art by Rags Morales and Dave Simons. In this first of several origin tale, the wizard, Omen, struggles with the pains of becoming an aging adventurer. Foxilon tells the tale of the Realms Master's strongest crew member, Minder. Find out how this Iron Golem with a soul came to be Dwalimor Omen's most trusted and beloved ally. Plus, Vartan receives a cryptic message from his deity, Labelas, warning of terrible times ahead. Cover price $1.50. "Head Cheese!" Story by Jeff Grubb. Art by Rags Morales and Dave Simons. 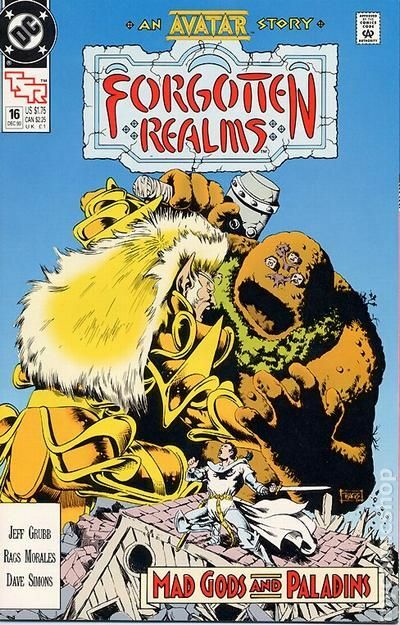 Learn more about the past of yet another member of the crew of the Realms Master in this origin tale. Foxilon, the diminutive thief, recounts the trials and tribulations that led him to his wizard friend, Dwalimor Omen. Cover price $1.50. Triangles! Part 1 of 3. "Jasmine!" Story by Jeff Grubb. Art by Rags Morales and Dave Simons. Priam tries out a new out fit, much to the amusement of his fellow crew members. However, things take a darker turn when the crew embarks on another quest to locate an object of power, the Horn of Valos. Along the way Priam crosses paths with a seemingly harmless hunchbacked thief who hides a startling secret. Cover price $1.50. Triangles! Part 2 of 3. "Rivals!" Story by Jeff Grubb. Art by Rags Morales and Dave Simons. 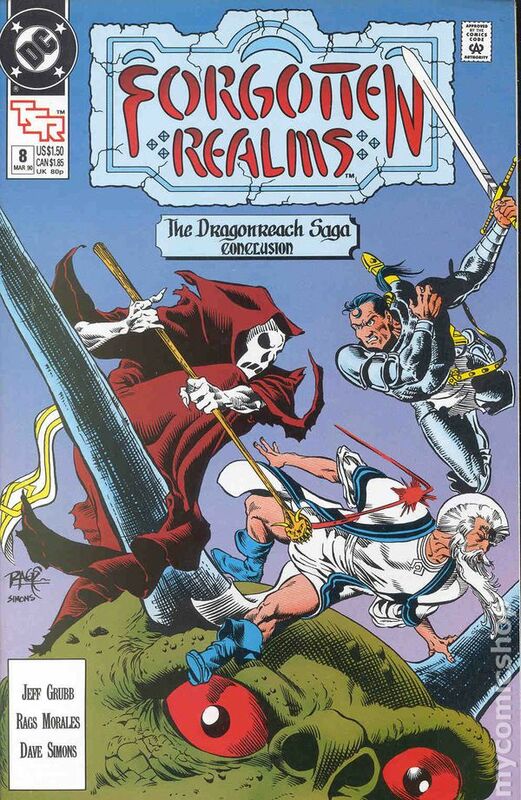 The city of Saerloon has proven to be nothing but trouble for the crew of the Realms Master. And the winged thief Jasmine is no different. 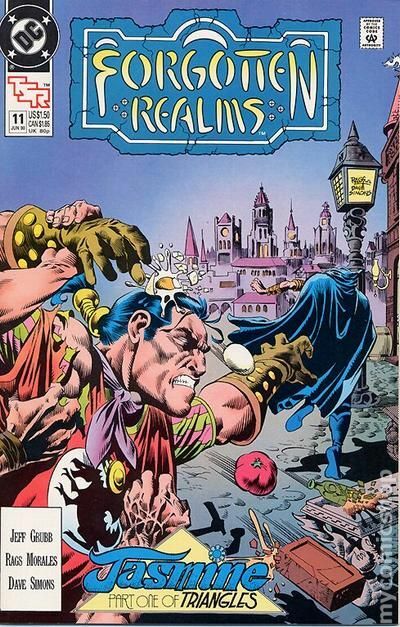 However, when a contingent of wizards from Omen's homeland arrives to arrest him, things go from bad to worse. Cover price $1.50. Triangles! Part 3 of 3. "Trial!" Story by Jeff Grubb. 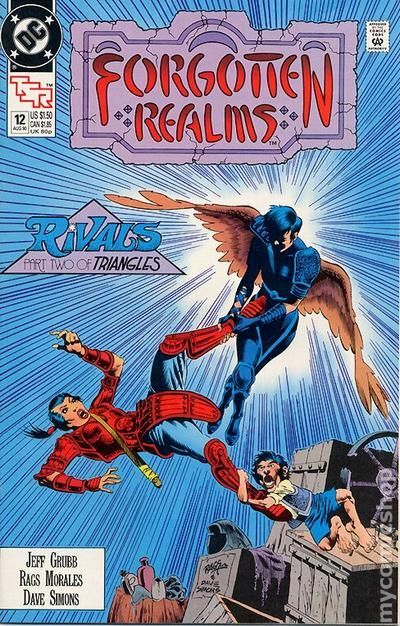 Art by Rags Morales and Dave Simons. Wizards are powerful and dangerous adversaries. 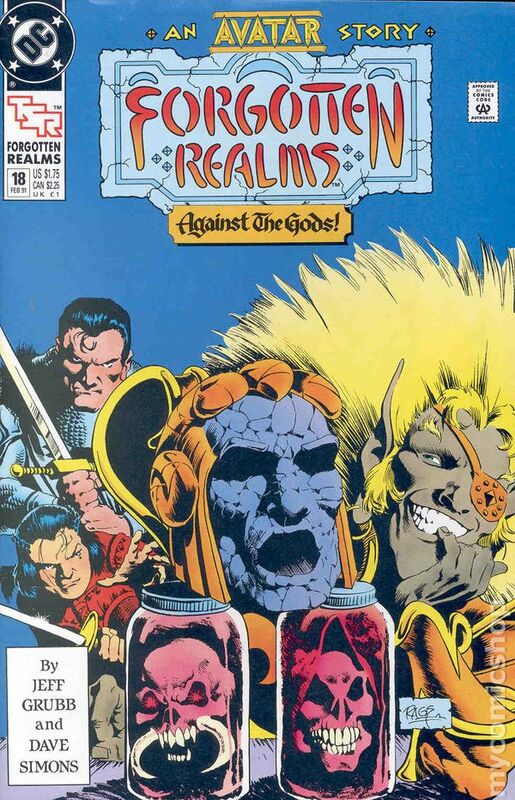 But the crew of the Realms Master are crafty and stalwart and they refuse to let their captain be taken without a fight. No matter the odds. 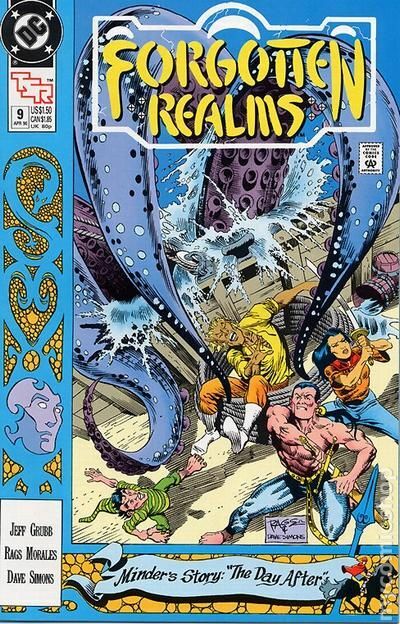 But can even this brave group of fighters stand against an entire ship of mages and their water elemental? Cover price $1.50. "Undead Love!" Story by Jeff Grubb. Art by Rags Morales and Dave Simons. An ancient and powerful lich (an undead mage) has just set his sights on the winged beauty known as Jasmine. 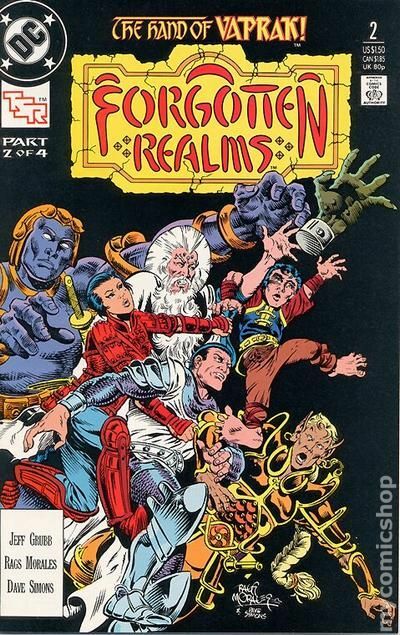 And not even the crew of the Realms Master may possess the power to stop it from getting what it wants. 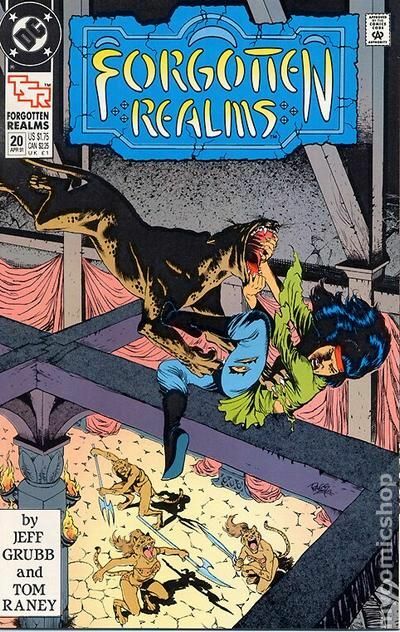 Story continues in TSR Worlds Annual #1 (1990). Cover price $1.50. "Picking up the Pieces!" Part 1 of 4. Story by Jeff Grubb. Art by Rags Morales and Dave Simons. 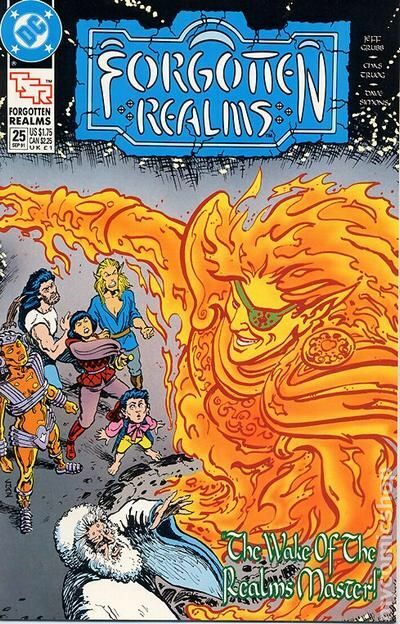 The Realms Master has been destroyed. 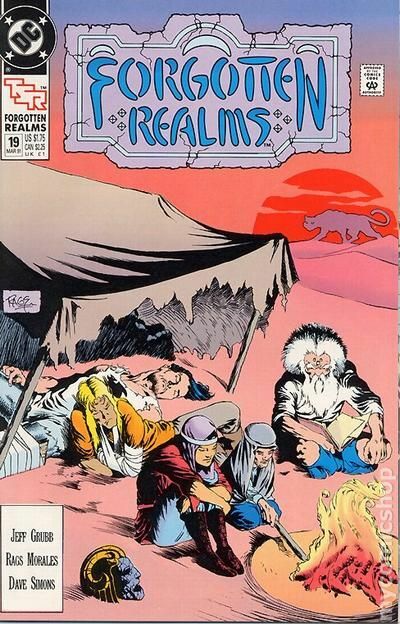 Used as pawns in the war of the gods (see Forgotten Realms (1989) #15-18), the heroes, injured and disenfranchised, struggle to survive in the harsh desert. However, things get worse. For as a wise man once said, "The hills have eyes!" Cover price $1.75. "Temptations!" Part 2 of 4. Story by Jeff Grubb. 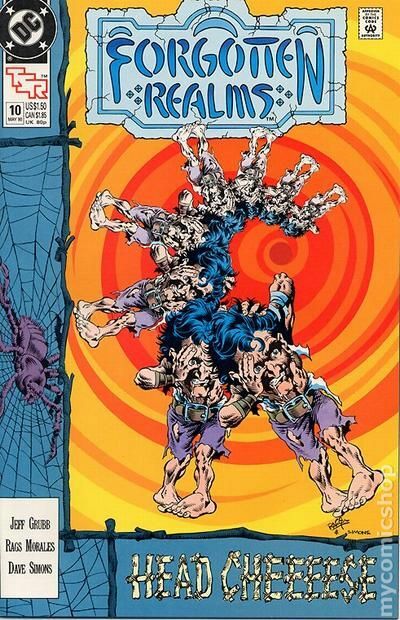 Art by Tom Raney and Dave Simons. 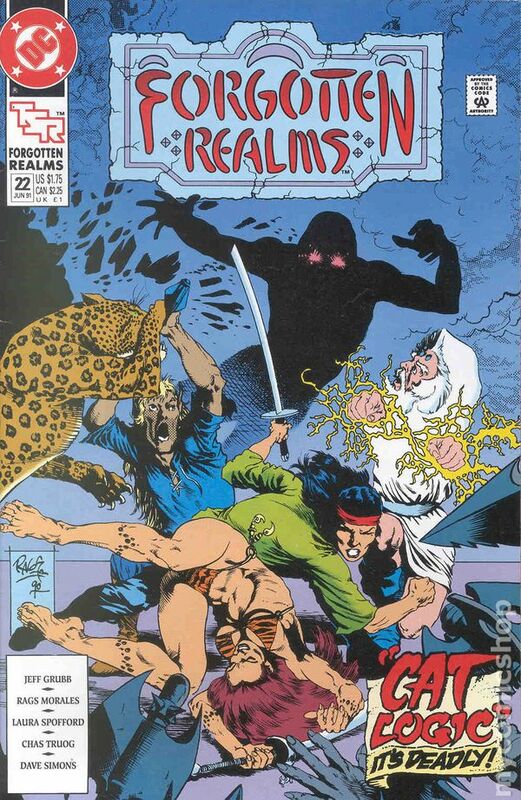 The surviving crew of the Realms Master have been taken prisoner by a clan of lycanthrope felines. Now, they must live out their days as slaves or become food for the beasts. Cover price $1.75. "Cannibal Girls (Won't You come Out Tonight)!" Part 3 of 4. Story by Jeff Grubb. Art by Rags Morales and Dave Simons. Still reeling from their battle with the elf deity Labelas, the crew of the destroyed Realms Master is in no shape to fight a clan of lycanthrope felines. This is a fact that may prove fatal for the fallen paladin, Priam Agrivar. Cover price $1.75. "Cat Logic!" Part 4 of 4. Story by Jeff Grubb. 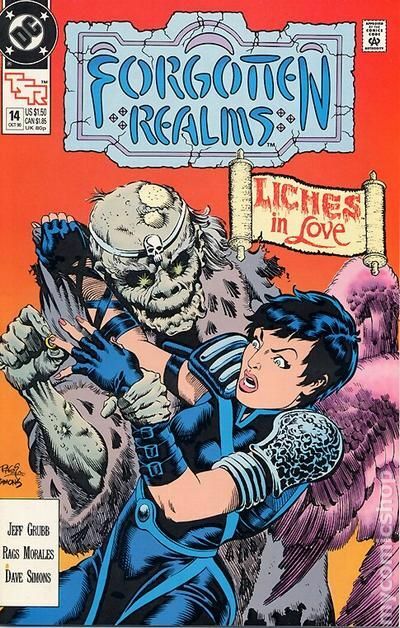 Art by Rags Morales, Linda Spofford, Chaz Truog, and Dave Simons. Omen, Vartan, Ishi, and Foxilon make a daring attempt to escape their lycanthropic captures, but find themselves overwhelmed. With their best fighter Priam down, and maybe dead, all hope seems lost. That is until an old friend with an unfamiliar face shows up to lend an iron-fisted hand. Cover price $1.75. 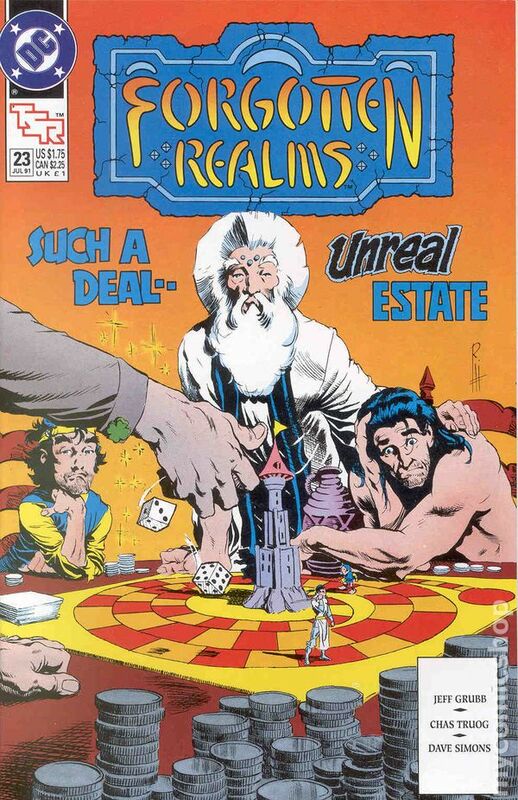 "Unreal Estate!" Story by Jeff Grubb. Art by Chaz Truog and Dave Simons. 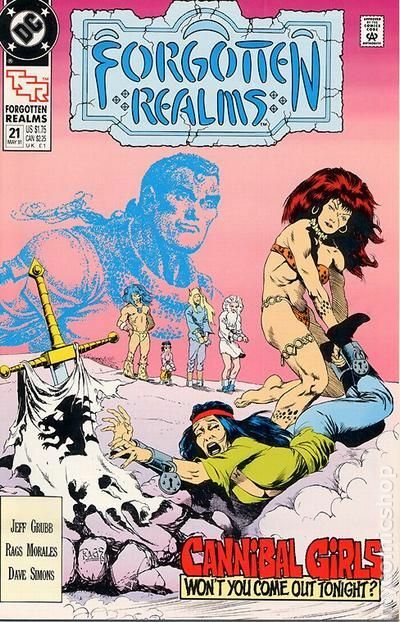 The fallen paladin, Priam Agrivar, finds his life and very soul at risk when he gambles with a conniving leprechaun. Swords are no good at the card-table. Sleight-of-hand is a thief's specialty. But can even Foxilon save his downtrodden friend from himself? Cover price $1.75. 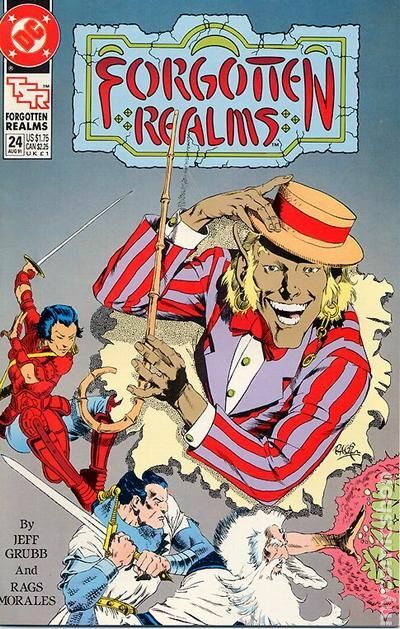 "Everybody Wants to Run the Realms!" Story by Jeff Grubb. Art by Rags Morales. In this off-beat tale, the elf, Vartan Hai Sylvar gives the reader an all access behind the scenes look at the Realms. 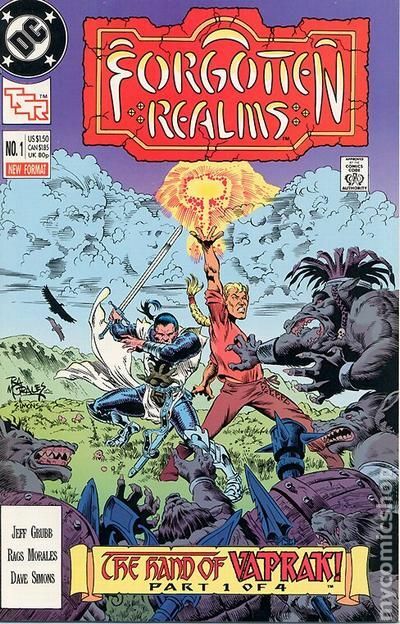 It's an insightful, albeit strange, look at the people, places, and things that make the Forgotten Realms a wonderful place to visit. Featuring guest appearances by everyone. Cover price $1.75. Final Issue. "Wake the Realms Master!" Story by Jeff Grubb. Art by Chaz Truog and Dave Simons. The epic adventures of our heroes comes to an end, but not before some much needed closure. 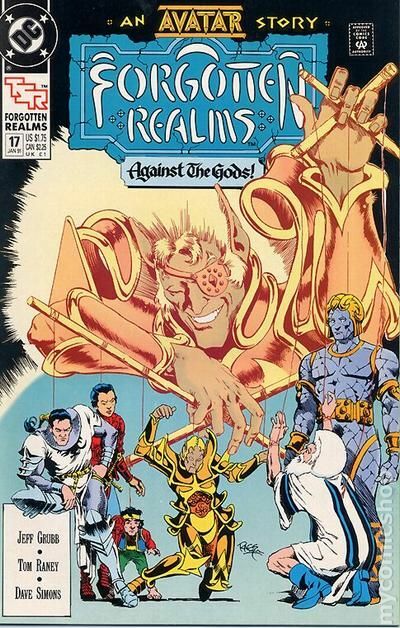 In this swan song to the crew of the Realms Master, the elf deity, Labelas, attempts to make amends for his actions during "The Times of Trouble" (see Forgotten Realms (1989) #15-18). As Priam, Ishi, Foxilon, Minder, Omen, and Vartan get their hearts desire, even a god can know forgiveness. "This is a touching send off to a much missed title." - Odinson, Lonestar Comics Archivist. Cover price $1.75.